Amazon USA online store has all for anyone at cheap prices! That is why international shoppers like to shop at Amazon USA online store. But one problem always faced by Amazon international shoppers is the international shipping. Though Amazon itself has the AmazonGlobal Program available for international shoppers of certain limited countries, their international shipping rate is too high and there are also import fees, duty and taxes to add, wich finally exceeds the value of the item. Another restriction is you cannot buy all from Amazon but the international products. Fret no more, when you have USGoBuy package forwarding service with you! You can now shop like an American and really save money for your Amazon purchases. USGoBuy helps all international shoppers with the complete freedom to buy all stuff from Amazon and ship worldwide at quite affordable rate. Below are the details how USGoBuy package forwarding service works for international customers’ Amazon shopping and shipping. 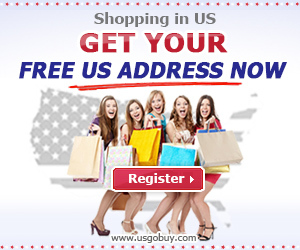 First USGoBuy offers international shoppers who have registered with us a free US address. With this US address, you can shop at Amazon like Americans. Visit Amazon.com and choose any items you like, and now you are eligible for the free shipping conditions! Leave your US address as the shipping address. When Amazon ships your purchases to our warehouse, we will inform you at once by email. You can give us further instructions on how we should handle your packages in your USGoBuy account. We can repack, consolidate and store your packages at our warehouse. If you are ready to receive your packages, pay the shipping cost and wait for your package to arrive at home! Shopping from Amazon online is recommended when looking for almost any item. From easy shipping to fast and secure delivery and payment, Amazon is a leading online source for products of all kinds. Not only does the site offer easy shipping and a secure payment system, but it also keeps all user’s personal information and data completely confidential. Amazon has quickly become a source for everything, from used clothing to new books; the site offers something for everyone. You can browse until you find what you are looking for or you can use the search feature. No matter what your preference, you are sure to locate the item that you want at an affordable price. The shipment calculators are available to determine how much shipping and handling is going to cost. Having items shipped to other countries is an option as well. Thanks to their on-site currency translator, you can easily complete transactions in Euros or any other form of currency. If you are looking for a place to easily and quickly purchase an item from the comfort of your own home, Amazon has what you need. The transactions are quick, easy and completely secure. The customer service is excellent as well. In order to have a best shopping experience at Amazon, it is useful to check the Amazon shopping guides easily available online. And another important tip to save money is search for coupons from Amazon or from RetailMeNot and other coupons sites.